Azeroth Metblogs » At Last! Something useful to do with Second Life! At Last! Something useful to do with Second Life! I’ve written before about my less than glowing feelings about Second Life. I’ve got friends who practically live there, and guildies who spend tons of time on their own island but everytime I check it out I leave disappointed and wondering “ok, so… ?” Well, some folks on the alliance side of We K(no)W finally figured out something useful to do there – plan raids during Tuesday downtime. Above is my Avatar standing on the UBRS map with a few notations. I’ll admit I only lasted a few minutes in there again this time, but at least it was interesting finally! 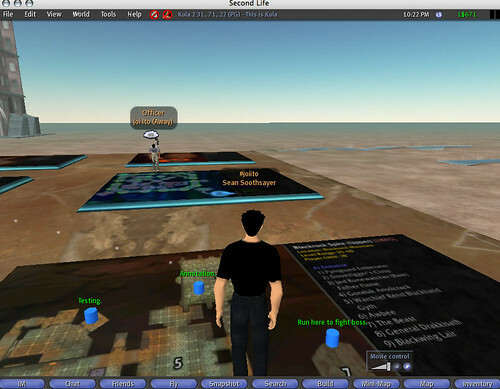 Wow-I think you’re right…that might be a great thing to use Second Life for. …if nothing else. I’m with you-I can’t stand Second Life. dude. that is awesome. i too haven’t found a good use for SL yet, despite how the rest of the tech community loves it so. but this, THIS, i can understand. What is going on? We are back to 1-2 posts every couple of days and then I have to read SL crap? Go post it on an MB SL site!!!! How is that post not WoW-related? Personally, I think it’s a great way for guilds to discuss issues and plan raids. i spent an hour or so on second life (my first and only hour or so) the other night. after 15 minutes i got bored and started making giant glass domes that i could drop on my fellow newbies trapping them… that really winds people up, especially if they don’t see it come down. from inside the dome, nothing looks different, you just can’t move much or fly! Methinks Azuthus could probably use a little more fiber in his/her/its diet. lol, strat planning for UBRS…. Strat for UBRS: avoid the eggs and you’ll be fine.